For Ένωσις, the modern political movement to unify Greece and Cyprus, see Enosis. Henosis is also a synonym of Bulbophyllum, a genus of orchid. Henosis (Ancient Greek: ἕνωσις) is the word for mystical "oneness," "union," or "unity" in classical Greek. In Platonism, and especially Neoplatonism, the goal of henosis is union with what is fundamental in reality: the One (Τὸ Ἕν), the Source, or Monad. The term is relatively common in classical texts, and has the meaning of "union" or "unity". To get closest to the Monad, One, each individual must engage in divine work (theurgy) according to Iamblichus of Chalcis. This divine work can be defined as each individual dedicating their lives to making the created world and mankind's relationship to it, and one another, better. This is done by living a virtuous life seeking after one's Magnum opus. Under the teachings of Iamblichus (see the Egyptian Mysteries), one goes through a series of theurgy or rituals that unites the initiate to the Monad. These rituals mimic the ordering of the chaos of the Universe into the material world or cosmos. They also mimic the actions of the demiurge as the creator of the material world. Each individual as a microcosm reflects the gradual ordering of the universe referred to as the macrocosm. In mimicking the demiurge (divine mind), one unites with The One or Monad. Thus the process of unification, of "The Being," and "The One," is called Henosis. The culmination of Henosis is deification. Deification here making each man a god by unifying the concept of an external creator with themselves as creators, builders, craftmen of their own lives (one's life as their greatest work, their magnum opus), understanding the interdependence between the macro and microcosmic as the source of their activities. The divine unity here is a linear modalistic emanation i.e. Monad, Dyad, Triad, etc. As is specified in the writings of Plotinus on Henology, the highest stage of deification is tabula rasa, or a blank state where the individual may grasp or merge with The Source (or The One, this process being henosis or unity). This absolute simplicity means that the nous or the person is then dissolved, completely absorbed back into the Monad. Here within the Enneads of Plotinus the Monad can be referred to as the Good above the demiurge. The Monad or dunamis (force) is of one singular expression (the will or the one is the good) all is contained in the Monad and the Monad is all (pantheism). All division is reconciled in the one, the final stage before reaching singularity, called duality (dyad), is completely reconciled in the Monad, Source or One (see monism). As the one, source or substance of all things the Monad is all encompassing. As infinite and indeterminate all is reconciled in the dunamis or one. 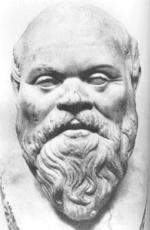 It is the demiurge or second emanation that is the nous in Plotinus. It is the demiurge (creator, action, energy) or nous that "perceives" and therefore causes the force (potential or One) to manifest as energy, or the dyad called the material world. Nous as being, being and perception (intellect) manifest what is called soul (World Soul). In Neoplatonic henology the individual is absorbed back into the primordial substance which is the substance (ousia) of all things, the uncaused cause. At the point of unity individuals become energy, and are then further reduced to force, potential (once they are stripped of their person, nous); the energy of individuals is then returned to the infinite non-sentient force—the Source or One—and reamalgamated back into the Universe. The process then starts again and brings another part of the universe into line with the Monad (see Pantheism). Hence the demiurge or creator is treated as an intrinsic (immanence) concept. The creator as category as divine mind, is the mind, therefore not outside the mind and is a construct called consciousness (nous) and does not objectively exist (per se). As nous or consciousness is but energy, activity in force. The actualization of things in potential. Potential can be called space, time as indeterminate, infinite, never ending. The demiurge or nous is the first sentience, a reflective duality that in the process of perpetual recurrence is man, himself. The Monad, source or one is force, potential or dunamis it is the irrational or indeterminate vitality and is as irrational non-sentient. It is the substance of all things and that in its rich infinitiness reflected back on itself causing the demiurge, dyad, nous, as reflection or consciousness. Within the works of Iamblichus, The One and reconciliation of division can be obtained through the process of theurgy. By mimicking the demiurge, the individual is returned to the cosmos to implement the will of the divine mind. Iamblichus used the rituals of the mystery religions to perform rituals on the individual to unite their outer and inner person. Thus one without conflict internal or external is united (henosis) and is The One (hen). Neoplatonism here is taking the concept of primordial unity (henosis) as rational and deterministic, emanating from indeterminism an uncaused cause. Since consciousness is an emanation it is not created nor is a caused cause per se. Unity (henosis) is no longer strictly rationalization (reconciliation) of man with being and becoming (ontology) but in the works of Neoplatonism considered also, salvation (soteriology). ↑ LSJ entry for enosis ἕνωσις, -εως, ἡ, (from ἑνόω "Ι unite") A. combination into one, union, Philol.10, Archyt. ap.Stob.1.41.2, Arist.Ph.222a20, GC328b22, Phld.Po.2.17, Ph.1.45, al. ; “τοῦ συμφραζομένου” A.D.Synt.175.16, cf. Hermog.Id.2.11: pl., Procl.Inst.63. II. compression, Heliod. ap. Orib.46.11.20. ↑ Ennead III, 8  9, 29-40 A. H. Armstrong's translation.